Open from the day after Thanksgiving through December 24th. Looking for land, a residential or seasonal home in the area? Visit Blue Spruce Realty now! 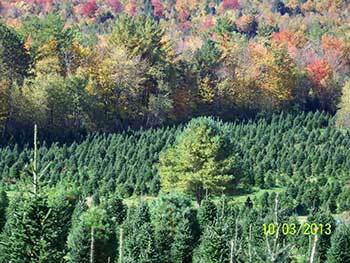 Bakersfield Tree Farm began over 24 summers ago, when the Foote family planted about 5,000 trees in a sunny meadow just outside Bakersfield, Vermont on Route 36. The meadow is home to over 20,000 Christmas trees, ranging from stately, room swallowing Firs and Pines, down to three foot table-top sizes.We have hand saws you can borrow. Both rope and assistance with tying your tree securely to your vehicle are available. 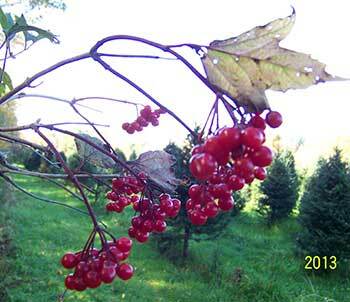 If you don't care to walk out in the trees to choose and saw down your tree, we have plenty of fresh-cut choices in various sizes and varieties in the yard. We also hand bind wreaths of various sizes, shapes and decoration daily. We prefer natural material in the decor. We also offer undecorated wreaths. Prices vary with size and decoration. Bring your family and make it a holiday tradition. We always have free candy canes and share our life-size dancing and singing bear, snowman and Santa, with kids from age 1 to 100. We have sleds for moving trees or for children to use when the ground is white.We encourage you to bring your camera. Well-mannered dogs on a leash are always welcome. We aim to provide an enjoyable adventure, with accessible terrain in a beautiful country setting. If you have special needs, such as limited mobility, please call us, we'd love to know how we might help you enjoy a visit. Watch for our large white sign on the South side of Route 36. Gary & Alice Foote are your hosts. We welcome your visit.